University of Louisville sophomore quarterback Lamar Jackson (Pompano Beach, Fla.) has been selected as the 2016 Walter Camp Player of the Year. The Walter Camp Player of the Year is voted on by the nation’s 129 Football Bowl Subdivision head coaches and sports information directors. 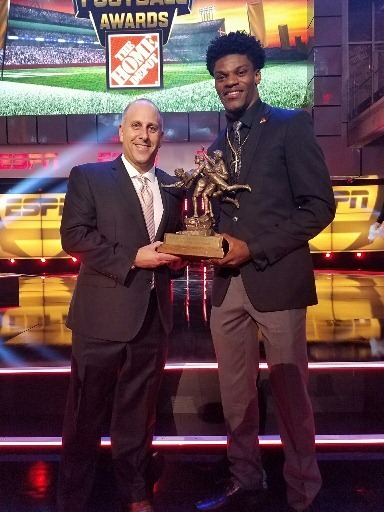 Lamar Jackson with Walter Camp President Rob Kauffman at the College Football Hall of Fame (photo courtesy of Mike Madera). Other finalists for the 2016 Walter Camp Player of the Year award included quarterbacks Deshaun Watson (Clemson) and Jake Browning (Washington), defensive lineman Jonathan Allen (Alabama), and linebacker/return specialist Jabrill Peppers (Michigan). The 50th recipient of the Walter Camp Player of the Year award, Jackson is the first Cardinals player to win the prestigious honor. Jackson is the 18th quarterback to earn the award. Jackson is also ninth player from an Atlantic Coast Conference school to win the award, and the second in the last four years (Jameis Winston, Florida State, 2013). Jackson has been a dual-threat at quarterback for the 9-3 Cardinals, who will face LSU in the Buffalo Wild Wings Citrus Bowl on December 31 in Orlando, FL. The 2016 ACC Player of the Year, Jackson is the first player in Football Bowl Subdivision history to register 3,300 passing yards and 1,500 rushing yards in a season. Jackson also became just the sixth player in FBS history to rush and pass for 20 touchdowns in the same season. The Pompano Beach, Fla., native set an ACC record by accounting for 51 combined touchdowns (rushing and passing), which ranks second-best nationally. Jackson also ranks second in the nation in total offense (410.7 yards per game). He broke the conference record for rushing yards (1,538 yards) and rushing touchdowns (21) by a quarterback. His 1,538 rushing yards were also a school record. He has accounted for 73.4 percent of his team’s total offense this season. Voted one of the team’s captains, Jackson has passed for 3,390 yards and 30 touchdowns. He totaled a pair of 400-yard passing games this year, including a career-best 417 yards in a win on the road at Marshall on Sept. 24, and 411 yards in a victory at Syracuse on Sept. 9. Jackson amassed an ACC single-game record of 610 total yards in the win over Syracuse, a game in which he came within one rushing yard of becoming the first player in FBS history to run for 400 yards and pass for 200 yards in the same game. Jackson was a three-time Walter Camp National Offensive Player of the Week honoree (Sept, 4, Sept. 11 and Nov. 6) – the first three-time winner in the 13-year history of the award. Jackson, along with members of the 2016 Walter Camp All-America team, and other major award winners (Alumni Award-Orlando Pace; Man of the Year-Warrick Dunn; Distinguished American-Mike Ditka), will be honored at the organization’s national awards banquet, presented by KeyBank, on Saturday, January 14, 2017, at the Yale University Commons in New Haven.